More than ever before, this year we saw an unprecedented amount of larger than life smartphones entering the space – commonly known to many of us as “phablets.” They’re gargantuan devices that might overpower those with small appetites, but they serve their purpose in their own sort of unique way. Even with all of the hoopla surrounding “flagship” smartphones, these phablets of sorts have become an indelible part of the industry, as they really do super-size things. For Android, there’s no arguing that the Samsung Galaxy Note 3 has been the most prized device, not only because it’s armed with today’s most cutting-edge hardware, but because Sammy is able to refine the experience by throwing in several useful features that increase its functionality. Meanwhile, Windows Phone is now finally in the mix, thanks to the recent introduction of the mighty Nokia Lumia 1520. Obviously, these two aren’t afraid to expose their sizes, but it’s a battle between the best from each respective platforms – so let’s see who can come out on top! When it comes down to beauty, we really have to go with the Lumia 1520 on this one, mainly because of its stylish attitude. Throw in its tapered design and the fact that it’s available in various color options, it undoubtedly all helps to catch our attention from a first glance. Although it’s not as stylish, the Note 3 has more of a sophisticated appearance thanks to its faux-pas leather casing that’s further accented by the stitching around its rear. For all of its worth, it just can’t quite match the attractive star power of the Lumia 1520. It might be beaten in the looks department, but the Note 3 is more comfortable to hold in the hand – a lot easier too because it’s not as wide as its rival. Indeed, it’s still a beefy sized thing, but it’s much more forgiving when we factor in the heavier weight and pointed corners of the Lumia 1520. On the surface, they’re both constructed out of plastic, but the unibody construction of the Lumia 1520 tends to feel a bit sturdier – with less creaking around the edges too. 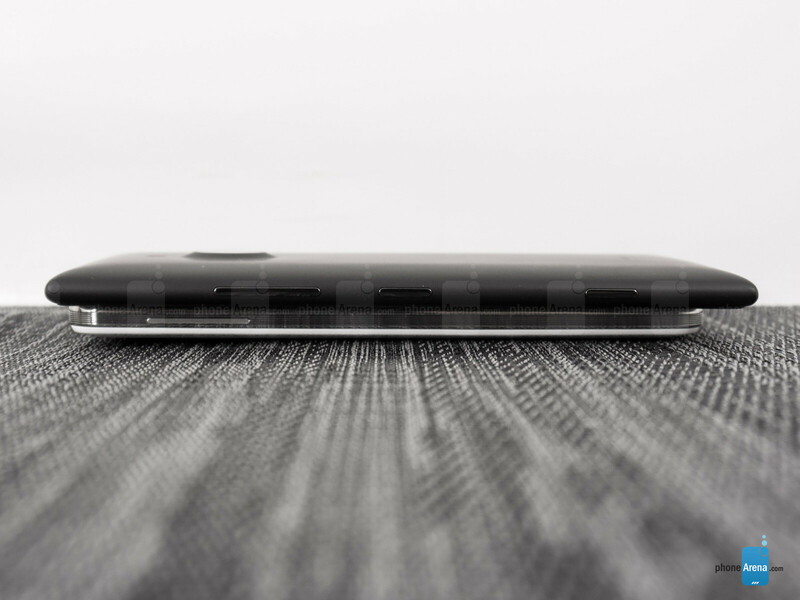 Looking around the edges of both devices, they have several things in common – like their power buttons, volume controls, 3.5mm headset jacks, and various microphones. However, the Note 3 dishes up a few extra goodies with its package. Specifically, they include a faster microUSB 3.0 port, S-Pen, and an IR blaster that turns the phone into a universal remote. Yes, we appreciate that they both have microSD slots, but it’s easier to access with the Note 3, since it’s right there when we remove its rear casing – whereas with the Lumia 1520, we have to use a SIM removal tool to access it. Grandeur is something that they prize highly, so it doesn’t surprise us that it extends into their cameras as well. Much like Nokia’s other recent offering, the Lumia 1520 is able to raise a few eyebrows due to its number crunching 20-megapixel PureView cameraThe Note 3’s 13-megapixel auto-focus camera is still a head turner on its own. Massive is one of the many words that can best describe their displays, but we can also say that they’re simply marvelous as well. Honestly, we like the two displays equally, as they have their own unique assets that make them so darn lovable. For the Lumia 1520 and its larger 6-inch 1080p IPS LCD display, we’re wowed by its immense size no doubt, but it dishes up the stronger brightness output and superior outdoor visibility. On paper, its 368 ppi pixel density count might be lower than the Note 3’s tally of 386 ppi, but seriously folks, it’s really hard to distinguish who really has the upper hand – even with a close inspection with our eyes. On the other hand, the Note 3’s 5.7-inch 1080p Super AMOLED screen comes to life thanks in part to the overly saturated colors it produces – giving it that subtle glow to reel us in from afar. Viewing angles are actually better with it, since it maintains its clarity at all angles better than the Lumia 1520, but it tends to wash out under outdoor settings. However, there’s a bit more geek tech involved with it, seeing that the screen itself is able to track either our finger, or the S-Pen stylus, as we hover them over the display. This review is all about the Gods that rule their platforms. Really hard for me to choose which one wins. Thats easy. For the hardware (build, etc) - Nokia 1520. For OS - Note 3. OS? Note3????? You must be kidding. Clearly you've never used a Note 3 before and just a blind hater. Oh not true smurf... 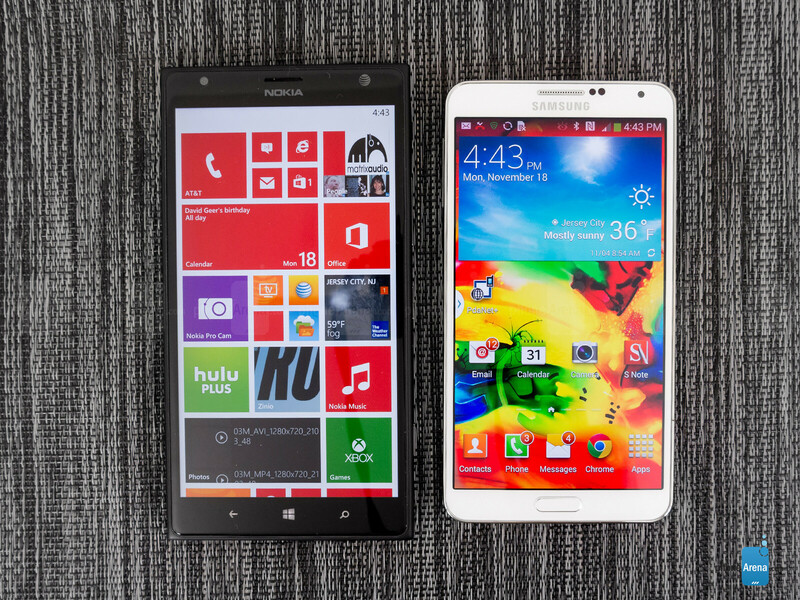 I've used and still use both platforms (1020 and note 3) and I STILL prefer wp8. What that says is that OS preference isn't fact. I doubt that since you've always been a nokia fanboy. Android just offer so much more than WP. Yeah but this is clearly fanboyism. 'Cause the Note 3 can actually do everything the 1520 can, but better(except may be taking low light pictures) and much much more! And don't come with the build argument, there's a lot of drop tests on youtube that prove that the Note 3 is hell solid. With the 1520, there is no "other" storage, just temporary files. The temporary files can be deleted right in the settings. If you want to compare storage wasted, tell me why WP8 only takes up 2.6GB of storage while Android with TouchWiz takes up nearly 7GB. 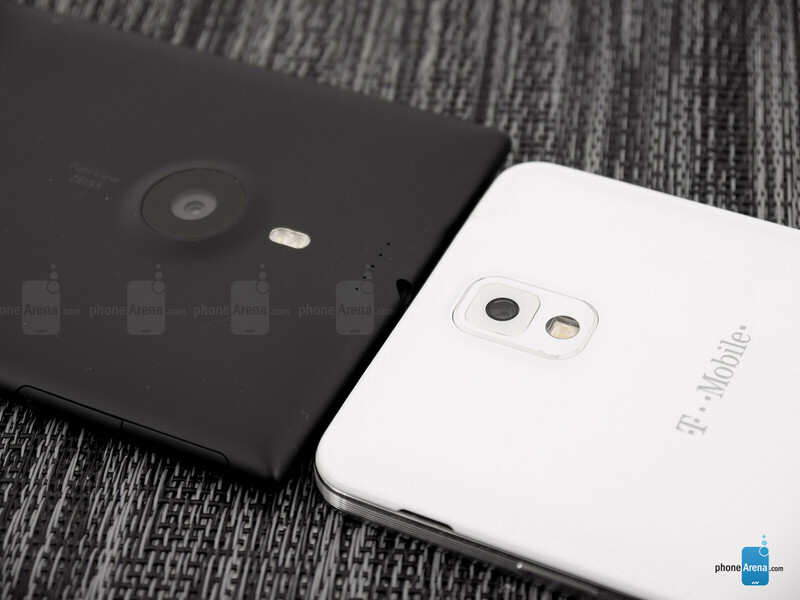 The Black Note 3 is more beautiful and classy than this Nokia brick. Check it out. They on purpose choose always the white one to review. 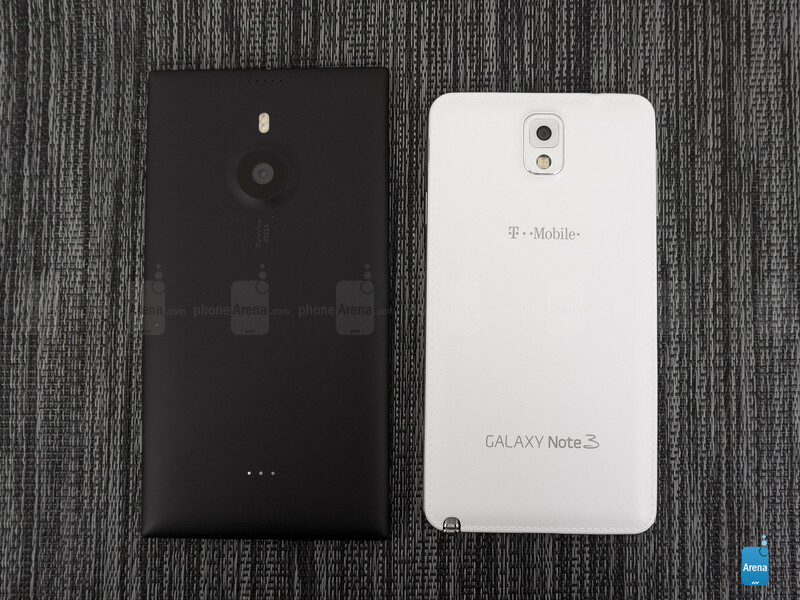 some prefer black note3, some prefer 1520 design, its a matter of choice. If phablet, than the only one I choose is the Note line. Big display with numerous functions...congrats Samsung. I honestly don't know what John is talking about. The Note 3 has a really bright screen. I can perfectly see clearly under direct sunlight with the brightness set at half or at auto. Never regret buying this phone off contract. True that. I have a note 3, and I live in sunny Dallas, and I never ever had a problem with the brightness of this phone, I just set it at automatic and I am good to go. The screen is so bright that I set the brightness at 1/4 when I am indoors. And when it comes to design, you can still notice notice how phonearena are still biased, the lg g2 is glossy plastic and they always have noe problem with it, but nooo samsung must be criticized in some way about their back plastic panel that can be replaced by leather/metal/carbon fiber and even wood panels for less than 10$ off ebay. "...an uninspired, plastic design... without any fancy appearance characteristics to make it stand out in any positive way... the occasional creaking sounds made by the back sure are irritating." From the G2 review's design section. Doesn't seem like they have "no problem" with it. I made a comparison between the review you just mentioned and other reviews where the g2 was compared to other handsets. You can go and check it by yourself, they gave the G2 heads up in the others, and I pointed out that it was hypocritical. And guess what, I got my comment deleted and recieved a warning. Fair enough. At any rate, you make a good point about the S4/N3's replaceable back. At least if you don't like plastic, you can replace it with something else. 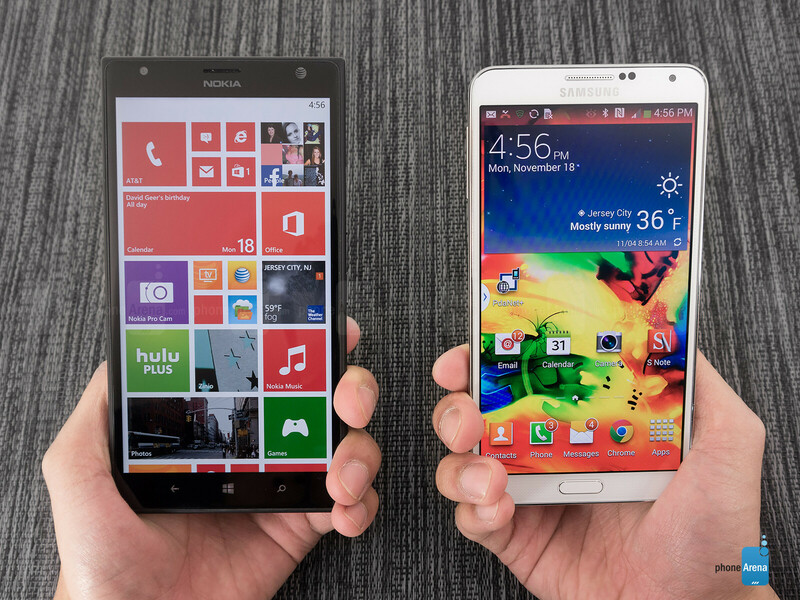 It's hard to choose, both are great phones! lol I knew it even before I read the review! If its not android it wont win! Why dont you guys stop being so biased and review whats in front of you! I bet if the 1520 had 10 days battery life it still would have lost because it does not run android! 1520 is wp and low light camera. Note 3 is everything you allways wanted from a smartphone. I´m still discovering new things to do with it. Gorgeous smartphone. If you want a good camera ...buy a camera. By the way, I´ve a Nokia 808. No wp ! Why do you have a 808 then and not a camera? how stupid can you be! You must be very dumb. I have an old Nokia (better than wp) and obviously ... a camera too. And Note 3. You should try, will make you clever. I still remember when people made fun of the original Note's size. Now it's got phones above it. 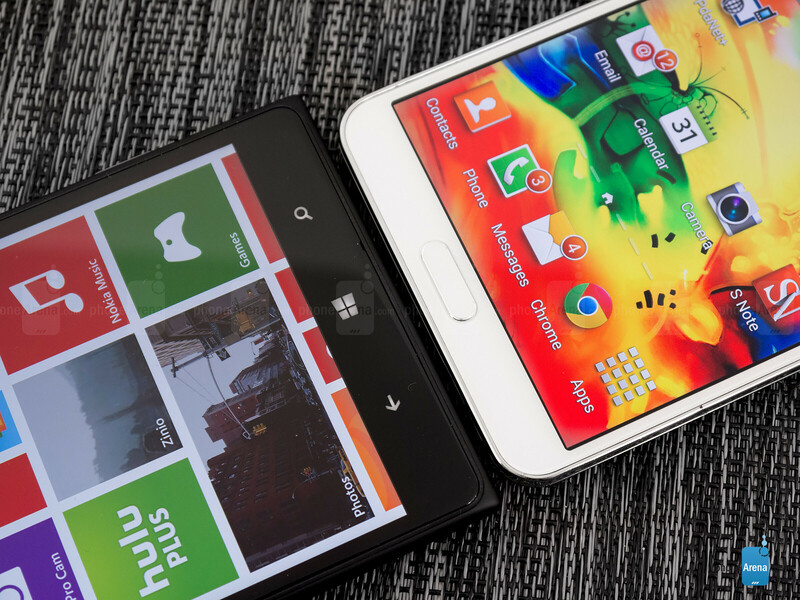 But Samsung is still the granddaddy of the phablet.